Guy Ben-Ari (born 1984 in Tel-Aviv, Israel) lives and works in New York City. Recently, he received his MFA from Columbia University's School of the Arts. Ben-Ari received his BFA with honors from Bezalel Academy of Art and Design in Jerusalem where he received the Loren and Mitchell Persser Award for Excellence in Painting. While at Bezalel Academy, he was selected for the Exchange Program for Merit Students to study painting at the Slade School of Fine Arts, UCL, London. Ben-Ari's work has been recently shown in New York City at Thierry Goldberg Projects gallery, 6-8 Months Project Space, the Neiman Gallery and the Fisher Landau Center For Art. Ben-Ari has participated in many group shows in Israel and Europe, most recently at Barbur Gallery, Minshar Gallery and Dollinger Gallery. 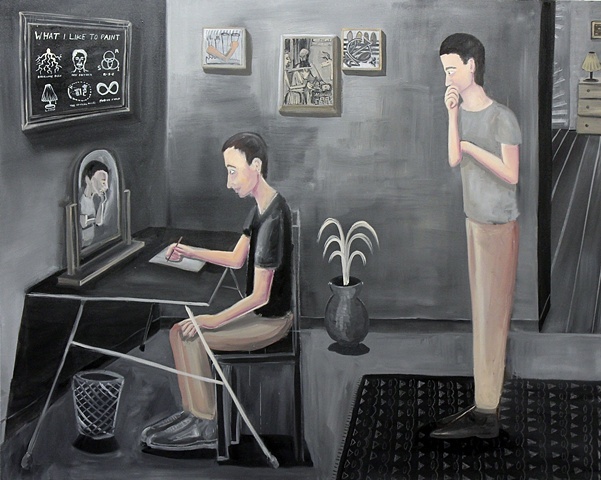 Ben-Ari's paintings are referential, figurative, narrative and illustrative. His work deals with the complex relationship between psychoanalytic theories and the medium of painting, while questioning the larger relationship of philosophy to art. In his latest work, Ben-Ari has been expanding his research of the illustrative by employing direct use of mental or visual exercises and theory. - Daniel Leuwers (Ed. ), "Les Tres Riches Heures du Livre Pauvre", Gallimard, "Mythite", p. 185. Existing on the border of folk illustration and the contemporary reduced painterly gesture, my work deals with systems of classification and the relationship of philosophy to art. My most recent works use painting as a tool for examining didactic strategies - the creative process functioning as an experiential learning process - by illustrating concepts from psychoanalytic theory. Stemming from a simultaneous fascination with and reluctance toward theoretical discourse, it addresses the discourse itself through imagery taken from concepts in the writings of Gilles Deleuze, Michel Foucault, Jacques Lacan and others, and calls to the possibility of literalness in painting. 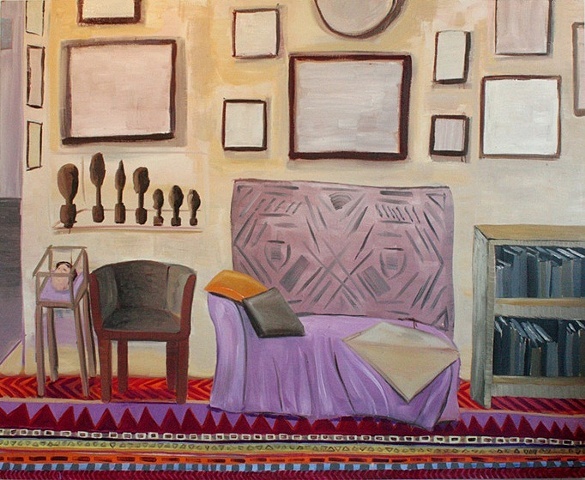 The paintings, in oil on canvas, are referential, figurative, narrative and illustrative. Composed in bright colors on large canvases or in gridded installations of smaller ones, their subjects originate in jokes or illustrations of psychoanalytic ideas or situations: the existence of the unconscious, the gap between signifier and signified, the ceaselessness of desire. In one painting, titled "Mirror Suspension," an infant developing his ego in Freud's "mirror phase" speaks to the development of artistic approach and methodology. 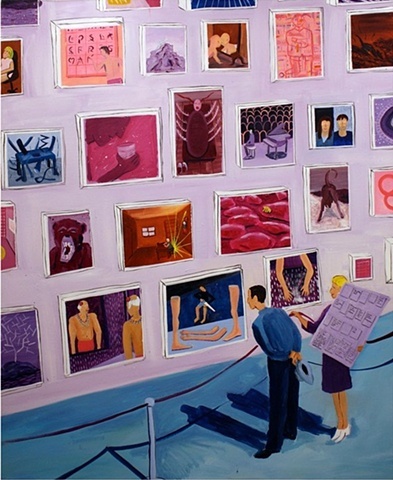 In another, "Becoming Human," a man and woman walk through a gallery of paintings, each depicting some literal or associative illustration of a concept from psychoanalytic theory. Different forms of figuration appear in much of my work: from the museum goers to portraits of the philosophers or of my father, and even in abstract faces that emerge, upon close examination, from a large-scale painting of the library of Babylon. In one sense, many of my paintings are humorous case studies examining issues of acceptance and taste in contemporary art. In another, they reference the reductive qualities of naïve arts and craft, suspending or reconstructing a memory or scenario in a sparse and self-referential way that discounts formal questions in favor of questioning their efficacy and purpose. I'm working with the notion that taking a metaphor literally is to kill the metaphor, and I'm using paintings to examine that very process. Giving visual expression to ideas from theoretical readings plays on the accessibility of terms and the level of knowledge that the viewer brings to the painting, while functioning as a mediation between the real and symbolic that these theorists explored.